Background and Objective: α-Tocopherol is the active form of vitamin E which has various biological functions. However, the exact molecular mechanism of its action is not fully understood. Thus, the main objective of the current study is to determine the contribution of α-tocopherol in counteraction of the apoptogenic signaling pathways induced by deltamethrin in murine thymocytes and splenocytes. Methods and Results: Deltamethrin (25 µM) induces apoptosis at 18 h through the activation of reactive oxygen species, caspases and depletion of glutathione in thymocytes and splenocytes. MTT assay results have shown that α-tocopherol (10 and 50 µg/ml) when added along with Deltamethrin (25µM), increases the viability of thymocytes and splenocytes in a concentration-dependent manner. The α-tocopherol treatment reduces the early markers of cell death (ROS and caspase3 activation) significantly. Further, the depleted GSH by deltamethrin has also been restored by α-tocopherol. At 18 h, α-tocopherol (50 µg/ml) significantly reduced the Deltamethrin induced cell death. In additional, phenotyping and cytokines assay have demonstrated that alpha-tocopherol significantly ameliorated the altered immune functions. 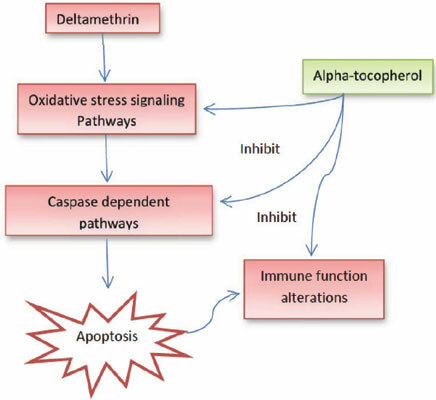 Conclusion: These findings indicate that α-tocopherol shows immunoprotective effects in Deltamethrin induced splenic and thymic apoptosis by inhibiting oxidative stress and caspasedependent apoptogenic pathways. Deltamethrin, oxidative stress, apoptosis, phenotyping, alpha-tocopherol, immunotoxicity.